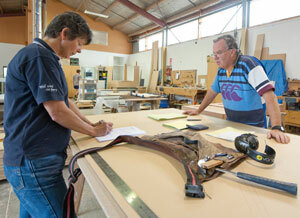 Rob O'Keeffe trained as a joiner in Upper Hutt before moving to Wanganui to work as a joiner and boat builder. Rob O'Keeffe Joiners started business in a converted horse stables at his rural family home before lack of space forced a move into a rented workshop in the city to work on the repair of a high profile local power boat. The business became incorporated in 1999 with further expansion necessitating another move to the bigger site occupied by the present factory. 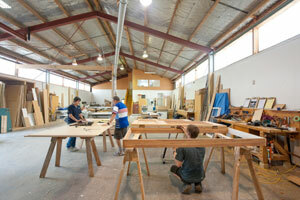 The company started out as a traditional solid timber company focussing on doors, windows, stairs and mouldings. However, over recent years the market has been moving more towards board work – making the likes of commercial units and office reception desks with a significant amount of new kitchen work now being sourced in the Wellington region. So the business has split into these two sections with some crossover between the areas. Two people work full time in each area with Rob himself working across both. Three out of the four workers in the factory have come through or are in apprenticeships with Rob. "Our manufacturing work is mainly architecturally designed or designed by us for the client," says Rob. "We have to produce high quality products which are customised for a particular environment and to be used by a specific group of people." The range of machinery in the workshop is fairly traditional, with little need to invest extensively in complex computer-controlled equipment. 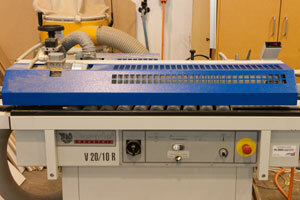 As in all joinery workshops, care and proper use of these machines is of paramount importance. "We need people who are sensible and can operate the machines safely and maximise the capability of the machine - which includes being able to extend its useful life." Rob will know at the start of each job whether the company will be involved in the installation – they would normally install kitchens, for example, but the builder will normally install doors, windows and staircases. With spiral staircases the joiner and builder will usually do it together. Communication between the joiner and the builder is critical to ensure that the particular fitting operates as intended. This means that the joiner needs good communication skills. "It generally depends on how much ownership we want to take of the project. If it's a special thing, then we'll take ownership and be working side-by-side with the builder. But basically, its builders on the site and joiners in the workshop – ownership for us is in the kitchens and specialised units." Some small work is too time consuming for the company to do cost effectively. "People come in off the street with small jobs and wonder why you just can't do it there and then and also why its going to be so expensive. While we're keen to help people with these small jobs, they've got to realise we're running a business and the jobs have to be economical." The company has now firmly established a position in the region as a small family business with a reputation for its ability to present high quality custom built wooden products. It regularly submits entries in trade competitions and the company received two awards in the 2006 NZTIA Solid Timber Joinery Awards. We are a member of the Wanganui Chamber of Commerce.